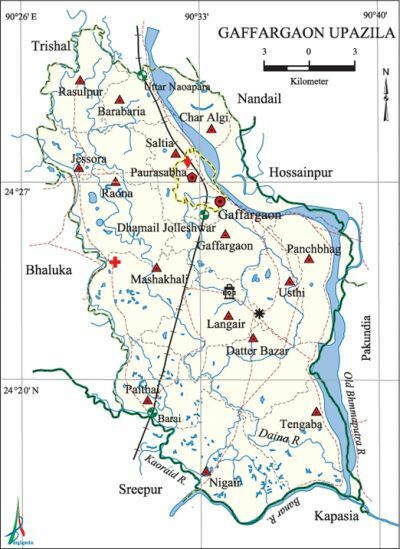 Trucks, CNG auto-rickshaws and other vehicles fell victim of gang robberies on the Gafargaon-Hossainpur road at Pagla in Gafargaon upazila of Mymensingh at about 4am on Sunday. Passengers and drivers said that a group of 7/8 robber in front of Darul Ulum Quami Madrasa of Dighirpar seized a truck with cattle traders blocking the road with a tree on the road. The robber robbed lakhs of taka from cattle traders obstructing a truck. After this, the robbers stopped CNG auto-rickshaws and robbed off 15/20 passengers frightening them with machete, Chinese axe, knife and dagger. Some female passengers were victims of molestation at this time. Abdul Aziz of Khurshidmahal village said, “We were going to catch Jamuna train. On the way, the robbers took away Tk 20,000 at Dighirpar. CNG driver Jalal said there have been several gang robberies in the last three or four months. Pagla Police Station OC Mohammad Shahinuzzaman said police officers went to the spot to investigate the matter.